The great thing about these NeoPixel strands is that most of the wiring is already done for you; we just need to make some connections at the ends. We'll show making an adapter for the microcontroller, then attach the NeoPixels with their included connector. Power connects at the opposite end of the light strand. That’s something frequently overlooked with NeoPixel projects: while color data must travel in a specific direction from “in” to “out,” power can go either way. In the diagram above, a 5V power supply is connected at the end of the strand, and we tap off this at the start of the strand to power the microcontroller, where the strand’s data input is also connected. 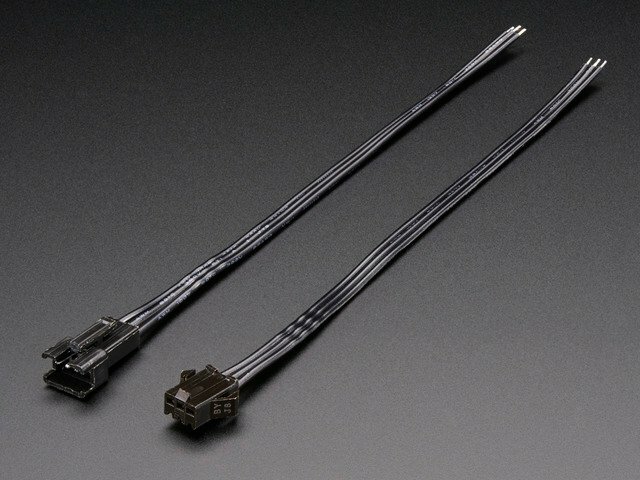 You can easily chain multiple light strands together with their included connectors. Just remember that if you have more than a few strands chained together, you may need a beefier power supply. A modest 2 Amp supply is good for a couple strands, or more, depending on how you set the brightness level. We've added a diode near the power supply to protect our pixels from too many volts. A lot of inexpensive power supplies aren't super accurate: they're labeled as 5v and they give off 5v-ish, and it's sometimes closer to 5.5 or 6. These neopixel strands can be pretty finicky, and they really don't like more than 5v. Adding a diode between the power supply and the LED strand will compensate by dropping the voltage just enough, so we get around 4.5-5.7 volts. 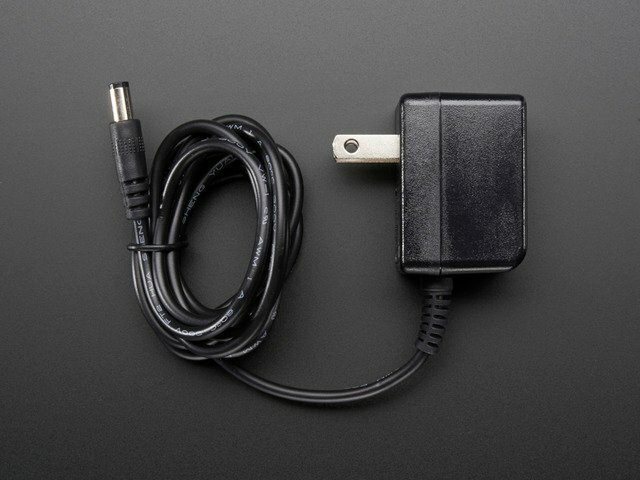 Alternatively, you can use a switching power supply with a 3 or 4.5 volt option, or one that's rated for 4.5 volts or lower. Just be sure you don't switch the supply up to 6 or 12 volts, or you could fry your controller and pixels! The shape was 3D modeled in Autodesk Fusion 360. It was created using t-splines, which is a part of the sculpting environment and toolset. The design is free to download and modify. I've included three different sizes of flower, all of which will clip neatly onto the light strand. 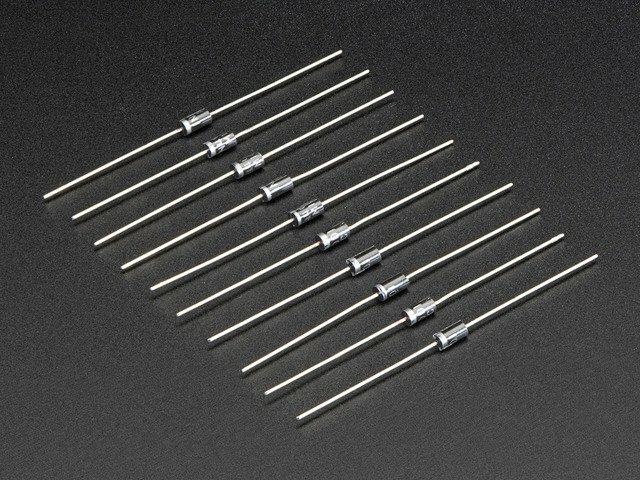 Choose your favorite size or print a few of each size to add lovely variety to your light strand. Because this part features no flat edges, it will require support material to 3D print properly. Most slicing software for 3D printers are capable of producing support material. A raft is also necessary for properly adhering the part to the bed. Print them face down with the clips up in the air. This makes it easier to remove the supports without accidentally breaking off the clips. This part is solid in design, so to make it hollow you'll want to print with 0% infill. NeoPixel color data must travel from the “in” end of the strand to the “out” end. Examine the backs of the pixels very closely. Printed on the PCB, you might see either some data direction arrows, or the words “IN” and “OUT” between pads. The weatherproofing epoxy makes things murky and you may need to look at several pixels before finding one. This is important! If you connect the microcontroller to the wrong end, the lights won't work. 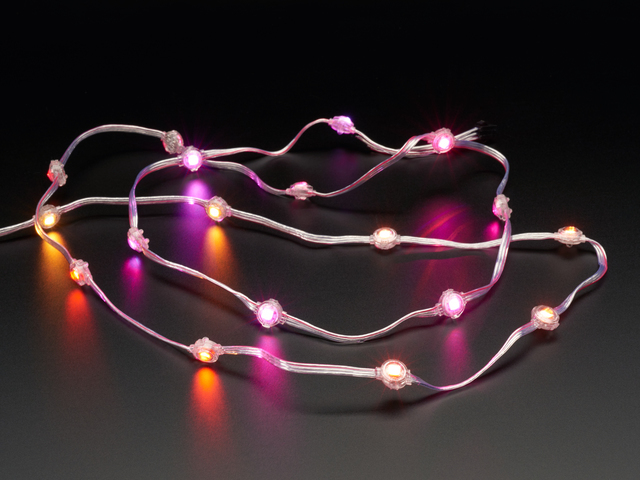 If you have multiple LED strands, plug them into each other to create one long überstrand. Each strand should have a pair of extra wires with exposed ends, for connecting power. Only one of these pairs is required. The rest should have their exposed tips trimmed flush or covered with tape or heat-shrink tubing to prevent electrical shorts. For 1 to 3 linked strands, let’s use the pair of wires at the end. For longer strands, choose a pair near the middle. Find the silver stripe on your diode. Diodes have a specific polarity, passing current in only one direction…the silver stripe is the + end. 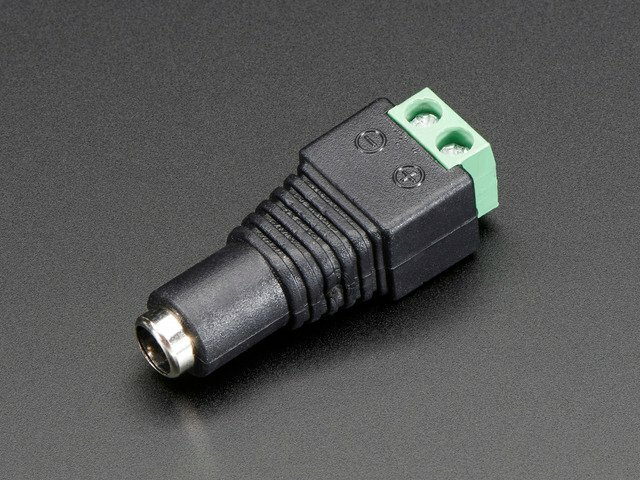 So we want to connect the + side of the screw terminal to the “dark” end with no stripe. Bend the diode's leg on this side and slip it into the port on the screw terminal. Solder the other leg to the RED wire coming from the LED connector. You may need to strip away a little extra insulation from the wires to make a good connection with the terminals. Tug a little on each wire to make sure it's firmly in place. To connect the microcontroller at the “input” end of the strand, I soldered up this little adapter cable using a 3-pin JST plug (to the LEDs) and a 2-pin JST cable (to the Circuit Playground). The RED wire from the LED strand should connect to the RED wire on the 2-pin JST plug. 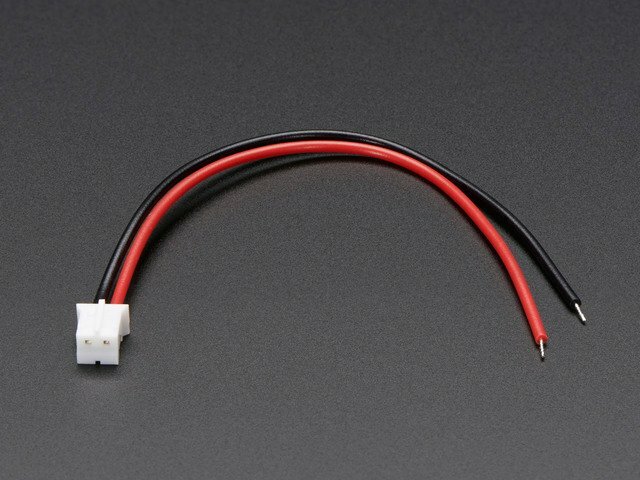 The OPPOSITE wire from the LED strand (furthest from the red wire) should connect to the BLACK wire on the 2-pin JST plug. The MIDDLE wire will get soldered to the Circuit Playground's A1 pin. If you don’t have a 3-pin JST plug, and you’re 100% okay sacrificing the “output” end of your LED strand, you can cut that plug off and use it as an input-end adapter. Do this at the mid-point between the plug and the last pixel, so there’s enough wire to be useful. Was your DC jack connected to the extra power wires there? That’s okay! Remember, the strand can accept power from either end. If you're doing this project with kids, you can use alligator clips instead of soldering. It won't stay permanently attached, but it's a fun and easy way to get the lights up and running. Clip the 3d printed flowers gently onto each light. If they don't seem to fit right, turn them 90 degrees -- the spacing between the clips is not exactly even; the wire goes between the wider clip spacing. If they still don't quite want to fit, use a heat gun on the clips for just 5-10 seconds to soften them a little bit, then press the flower onto the light. When the plastic cools it will grab and hold nice and tightly. 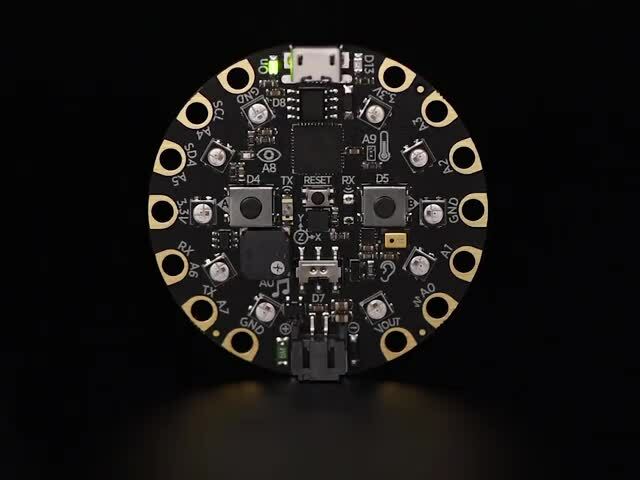 The Circuit Playground Express can be programmed a number of ways: it will run Arduino code, CircuitPython, or you can program it with MakeCode. This means you can drag and drop light animations and functionality using the Circuit Playground Express' onboard sensors without ever writing a single line of code. Just snap the blocks together and watch your lights dance. Check out our MakeCode intro guide here. For this project, I used the Circuit Playground's onboard light sensor to turn the lights on automatically when the room gets dark. When the room brightens back up, the lights will turn off. The lights are running MakeCode's built-in rainbow animation. Check out this guide for more info on working with neopixel strands and building your own animations. Go to https://makecode.adafruit.com/ and select "New Project". We soldered our light strand to pin A1. Tell the code by adding an on start loop (Loops > on start). This block will run ONCE when the board powers up, so it's the perfect place to define our setup. Drag the on start block above the forever block. Next go to "Variables" and drag set (item) to 0 into the on start block. Go to the "Neopixel" bin (you may need to click the "Light" bin to make it appear). Drag create strip on (A1) with (24) pixels into the block you just made, replacing the "0" field. In the "Neopixel" bin, find strip > show animation () for 500 ms. Drag this block into the foreverloop. Let's test to see if it's working. Plug your Circuit Playground Express into your computer with a USB cable. Green lights will appear on the Circuit Playground's face and it will appear in your list of devices, called CPLAYBOOT. If you don't see this, try double-clicking the reset button instead of single-clicking. Click the pink Download button on your MakeCode screen and the code you just made will download to your computer. Drag it onto the CPLAYBOOT device. Plug the light strand into power and you will see a pretty rainbow animation. Hooray! Let's make the lights turn on auto-magically when it gets dark, and off again in bright daylight. We can do this using the Circuit Playground Express' onboard light sensor and a little bit of experimentation. We want the lights to come ON when it gets dark in the room, and go OFF when it gets bright. Place one instance of (strip) set brightness to (0) inside each on light () loop. Leave the (light) one at 0, and set the (dark) one at 150 or so, or whatever you'd like your maximum brightness to be (on a scale of 1-255, 255 being the brightest they can go). Next, place both the set (dark) light threshold to 0 blocks inside the on start loop. Change (dark) to (light) on one of them, so one triggers above a certain brightness and the other triggers below a certain darkness. Every room or environment is different, so you'll need to experiment a bit to get the thresholds right. I found that set (bright) to 21 and set (dark) to 32 works well in a window-lit bedroom -- when I turn on my overhead lights, the light strand goes off, and when the overhead lights go off, the light strand comes on. Download the code and drag it to CPLAYBOOT to test and see where your light threshold needs to be. Experiment until it behaves the way you want. A bright flashlight is helpful for experimentation! Here's the completed project that you can play with directly. This guide was first published on Feb 08, 2018. It was last updated on Feb 08, 2018.